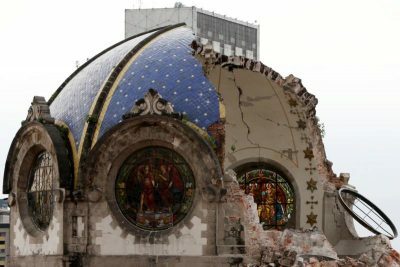 MEXICO CITY (CNS) — Holy Family Church has been closed off for security reasons while waiting for inspection for structural damage from the Sept. 19 earthquake. In the meantime, Masses are organized in the small chapel that lies hidden at the end of a patio behind the church. Congregants and passersby who seek spiritual comfort slowly fill the chapel to pray and listen. Behind the altar, where a tall statue of the Virgin Mary used to stand and overlook the chapel, emptiness prevails. “When I saw that my beautiful Virgin fell and broke in pieces during the quake, it broke my heart,” said Teresa Cabrera, leader of a Bible study group in the parish. Like many other parishes, Holy Family has collaborated closely with citizen groups to help with earthquake relief. “In times of crisis, people answer quickly, and they ask the church exactly what they need. And we provide it. It feels like hopping on a torrent of solidarity,” said Father Gonzalo Rosas, who serves at Holy Family Parish. Father Rosas has survived several natural disasters, but he said the extent of solidarity expressed in the aftermath of this earthquake is particularly astonishing. “I tell them, ‘Please, don’t bring any more sandwiches! We have too many sandwiches already,'” he said. 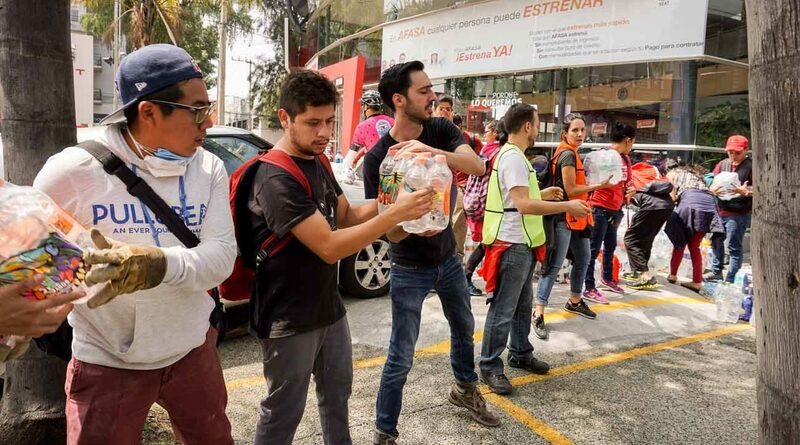 Thousands of volunteers and rescue squads have flooded Mexico City, where workers, electricians, nurses, students and others work side by side to save the last victims and bring relief to the survivors. Official data on the number and impact of volunteers does not exist yet. In areas where donation centers are numerous and well supplied in terms of goods and workforce, local churches direct volunteers and donors to nearby aid centers, where they can be of greater help. “We want to work with existing groups and be as helpful as possible,” Father Rosas said. However, he added, where donation centers are fewer, the churches take the donations and later redistribute them in remote areas. Valeria Vasquez, a teenager sorting donations at the Basilica of our Lady Guadalupe, told CNS she was restless and wanted to do more than just share posts on social media.